In October 1991, Anita Hill was called to publicly testify before congress, at senate hearings about her allegations of sexual harassment against her former boss, Clarence Thomas. Thomas was at the time a supreme court nominee, so these hearings served as a possible factor in decision making regarding whether Thomas was a suitable candidate for the court. As part of the hearings, Anita Hill was asked– and this is the important part– to testify about her experience working for Thomas, and so she did. What happened next is still discussed today. 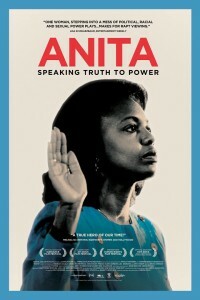 In 2013, twenty two years after her testimony, a documentary about Anita Hill’s story came out. The movie was screened on campus on September 17, in preparation for her upcoming lecture at Lesley University on October 5th. The film was especially interesting for me to watch, because I wasn’t born when Anita’s testimony took place, nor would I have heard about it. I’m an international student raised in Iceland, and I admit I had never heard her name until just last week, when I went to the screening of the movie. What struck me the most while watching the movie was the conduct of the congress, and the way the testimony was set up; Anita, a black woman, was sitting alone at a table facing about 10 white, male senators. What also struck me was the patronizing way in which they addressed her, and the repetitive (and sometimes appalling) questions they asked her, during the seven- hour hearing. As I saw it, few of the senators had thought of their questions with an intellectual purpose in mind; this was political, and it was often like she was the one to blame, rather than her boss, Clarence Thomas. But what really impressed me was Anita’s tranquil attitude, and her strength while addressing these matters. What followed her testimony (and the accusations against her) is what I believe might make any victim feel like all of it was worth it: her testimony opened up a dialog about the issue of sexual harassment, as well as about discrimination in the workplace. Anita Hill received thousands of letters of support after the hearing; demonstrations were held, and organizations to prevent sexual harassment were founded. In Anita Hill’s case, speaking up was not only a life-changing event but an event that ended up impacting harassment victims and other Americans across the country. By speaking up Anita affected the way sexual harassment is tackled in workplaces; this was a conversation that needed to be had, because sexual harassment had been going on unspoken, and unpunished, for years. Since the hearing, along with her work as a law school professor, Anita has written books, and lectured about discrimination based on gender and race. Watching Anita’s story on screen was very effective. Throughout the movie, it is clearly shown that she not only wished for the truth to come out, but she wanted the hearings to serve as an empowering precedent for other victims of sexual harassment. This movie is important because it helps her to reach a new generation of people, and keeps the dialog about this issue alive. To me, Anita Hill is truly an inspiring woman and I find it wonderful that students of Lesley University will have a chance to meet and attend the lecture of such a strong figure. I think the movie serves as a very good introduction to Anita’s story. I am glad I saw it, and I encourage all students who haven’t seen it to watch the movie. Above all, I encourage everyone to attend her upcoming lecture. It is open to all students and faculty, and it is free; but registration is required. I know I can’t wait to hear what Anita Hill has to say.